Taking inspiration from Porsche's decision to break out into designing everything from sleds to cellphones, Audi's decided that it now wants to apply its design chops to beautiful objects without four wheels. 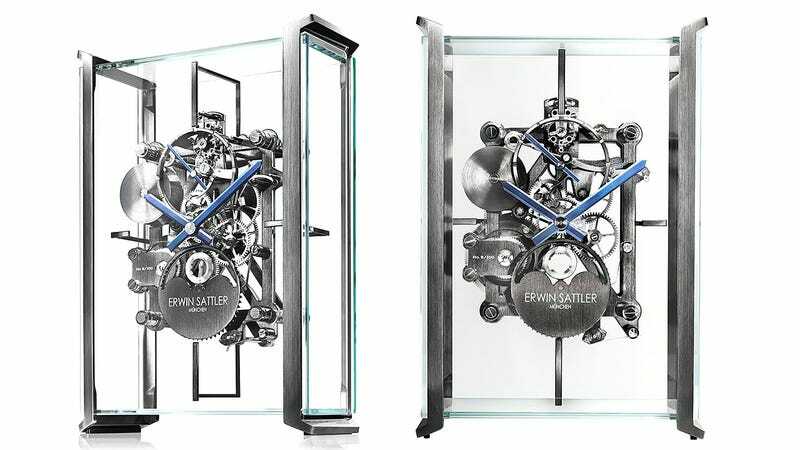 And the car maker's first creation is a stunning see-through table clock that leaves its complex engine completely exposed and visible—not hidden beneath a hood. Audi actually collaborated with watchmaker Erwin Sattler on the clock, with emphasis focused on the design and placement of the various gears which ties back to the company's automotive roots. And the lack of a traditional clock face, which usually obscures a timepiece's inner workings, puts all of the wonderful engineering on display as it counts off the hours.